Cameron International Oil Gas is a leading worldwide provider of flow equipment products, systems and services to oil, gas and process industries. 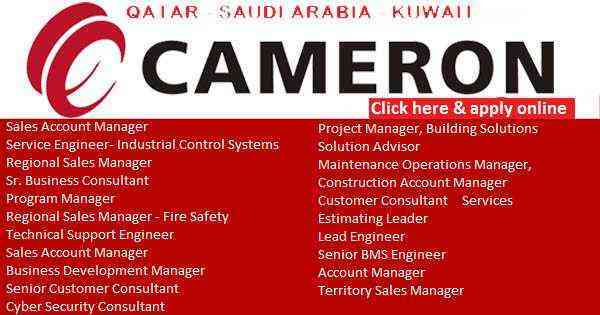 Cameron engineers design, and manufacture worth driven solutions for the worldwide oil and gas industry. It employs more than 28,000 people and is headquartered in Park Towers South, Houston, Texas. Cameron is united in a set of core values that enhance our product offering and embody who we are, both as individuals and as a company. Whether you’re professional in Administrative, Accounting and Finance, Engineering, Line Senior Network, Human Resources, Information Technology / Services, Marketing and Trading and any other areas, there is a career opportunities for you at Cameron International Oil Gas. Cameron International Oil Gas is looking for highly qualified and experienced experts who like challenges and opportunities. Cameron International Oil Gas remuneration consists of base pay and performance awards. Additional financial benefits include stock option plan, a distribution of benefits, pension and 401 (k) plan. Health, dental and vision care reimbursement accounts, family leave and medical disability are also provided. A variety of other benefits which include a resource center, child care, tuition reimbursement and paid time, to name a few, offers a balance of work / life.